Planting bamboo is great for the environment. Bamboo quickly establishes itself in areas where many other plants and trees will not survive, while promoting 35% more oxygen into the environment than an equivalent stand of trees. Research has proven that bamboo will sequester up to 15 tons of carbon dioxide from the air per hectare on an annual basis. The dense leaf canopy of bamboo also make it a great option for lowering light intensity and UV exposure. When planted near a home or building it works year round to help cool in the summer and insulate in the winter. 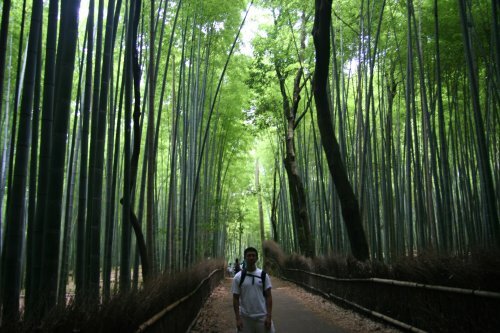 Traditional Asian belief holds that being in a bamboo grove restores calmness and stimulates creativity. Buddha is said to have considered a bamboo grove as his favorite resting place. Bamboo posses a property called "Bamboo Kun" which means that it is naturally anti-microbial. Testing has shown that even after 50 washes, bamboo fabrics retain their anti-fungal, anti-microbial nature. These properties make bamboo fabric a great option for those with allergies and sensitive skin. Bamboos has a natural wicking ability enabling it to wick moisture 3-4 times faster than cotton, while keeping odors at bay! Bamboo does not require any pesticides to grow, whereas cotton is one of the most intensely sprayed crops in the world. In fact a single Cotton t-shirt can require up to 2.5lbs of pesticides to produce. Bamboo fabric is super comfortable, wrinkle resistant and machine washable. Although it can look and drape like silk, it is not only more practical but also more affordable! Bamboo is an exquisite component of landscape design. For the human environment bamboo provides shade, wind break, acoustical barriers and aesthetic beauty. Bamboo is also evergreen and deer resistant. The first large scale planting of bamboo as an ornamental plant was designed and implemented by the man often referred to as the "father of American Landscape Architecture," Frederick Law Olmstead. The project was America's largest private residence, Biltmore House, designed for George Washington Vanderbilt. Nature's natural erosion control agent. Running bamboo's net like root system works to stabilize eroded river banks creating an effective mechanism for watershed protection. This aggressive root system combined with the dense canopy and accumulated leaf litter, enable it to greatly reduce runoff. These factors together help to reduce massive soil erosion while keeping up to twice as much water in the watershed. Bamboo has proven to reduce CO2 buildup in the atmosphere, while releasing up to 35% more oxygen into the atmosphere than an equivalent stand of trees. A natural bamboo forest grows new leaves and culms every year, providing a greater annual increase in biomass than a tree forest. In fact, a managed bamboo forest greatly outproduces a natural one.